Home | Newsletter 155: Millions of Low-Wage Workers Are Being Left Behind! Newsletter 155: Millions of Low-Wage Workers Are Being Left Behind! The Fight for $15 is sweeping the nation, from fast food workers mobilizing to state and city legislation, notably in California, which will phase in a $15/hour minimum wage for all workers over the next several years. Yet these successes stand in stark contrast to the silence of the federal government and its failure to raise the wage, currently $7.25/hour, since 2009. Two proposals to raise the minimum wage (one to $12.50/hour and the other to $15/hour) have been introduced, but Congress is making no progress bringing either of these forward. As other states move quickly to raise the minimum wage, workers in 21 states are stuck with the current federal poverty-level minimum wage. 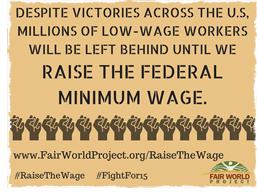 We need to raise the federal minimum wage to ensure that all workers are paid a fair wage. Take Action: Tell Congress you support raising the federal minimum wage for all workers, in all states, including wages for workers like farmworkers and tipped workers who are sometimes left out of minimum wage laws. Help Farmers in Ecuador Recover from Earthquake! 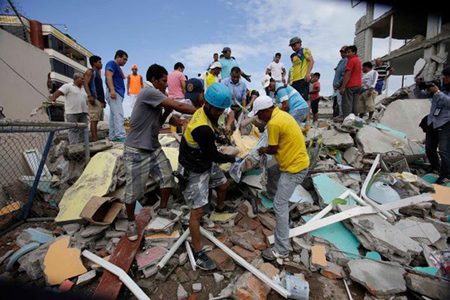 On April 16th, Ecuador experienced a 7.8 magnitude earthquake, killing more than 500 people, injuring thousands more, and causing much damage, including in the farming communities we support and promote, through organizations like the Small Producer Symbol and local fair trade networks. In partnership with Equal Exchange, we are collecting donations for these communities, which will be sent directly to local fair trade networks in affected parts of Ecuador. Read more from Equal Exchange. Make a donation designated to help communities in Ecuador impacted by the recent Earthquake. Do you know how many children in West Africa perform dangerous work in the cocoa industry? Do you know what percent of farms globally are considered small farms? Can you define regenerative organic agriculture? 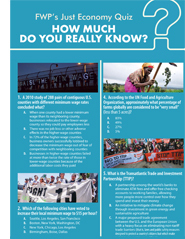 If you answered yes to all of these questions, you should take our latest Just Economy quiz and show what you know! If you answered no to any of these questions, you should still take our quiz – you will almost certainly learn something new! Will genetically “edited” food be regulated? From the blog: fast food workers and advocates of democracy have been mobilizing this month.